I haven't posted much recently as we are in the process of moving. We started looking during the first part of this month and we will get the keys to our new house tomorrow, so while it's nice to be moving, things have been hectic getting everything done in a short time period. We're going to be renting out our current home, so there is a lot to do to make that happen as well. I haven't had much time (or money) for cards lately. I know I'm behind on a couple of trades, but I haven't forgotten and will get them taken care of once we get into the new house. I did stop at the card shop on Friday, but only to get some 5000 count box and a super shoe box to help with packing. In the new house I'll have a den (a.k.a. man cave) and the plan is to thin out my collection one box/binder at a time. One thing I did do yesterday was propose a few trades on the Topps Diamond Giveaway site. Within a few minutes I was able to get the card below for 10 random cards that I had. There was one card from 1960 and three from 1974 and then everything else was from the 80's, 90's, and 2000's, nothing that I would have paid to have shipped so I was really happy to get this Diamond Die Cut Miguel Montero card! Happy Father's Day to all the fathers out there, and Happy Anniversay to my blog! Today is my blog's 2nd anniversary. My wife doesn't like to get me baseball cards as gifts because she thinks I have too many already, but she and my boys did get me this for Father's Day. 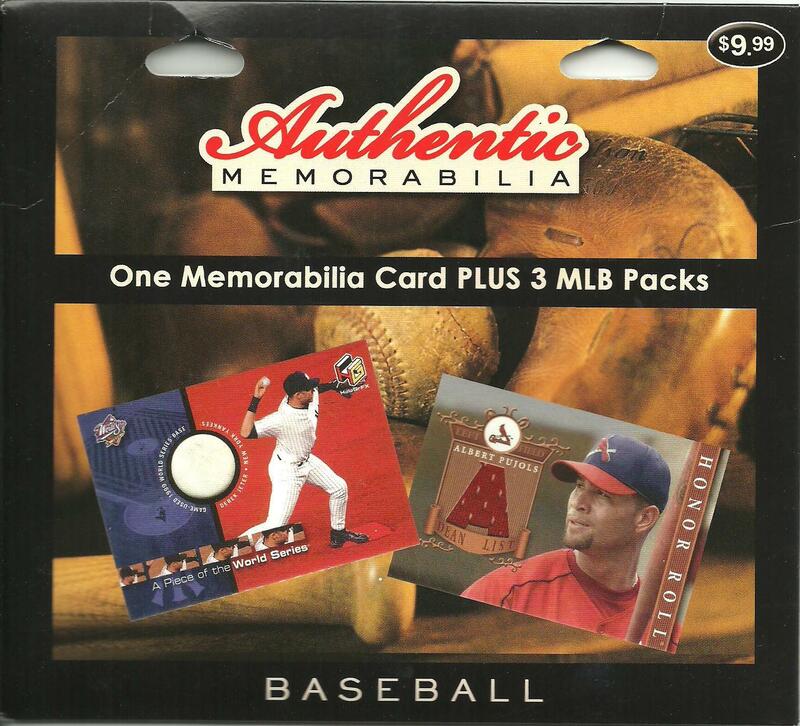 As you can see, it contained 3 packs and one memorabilia card. 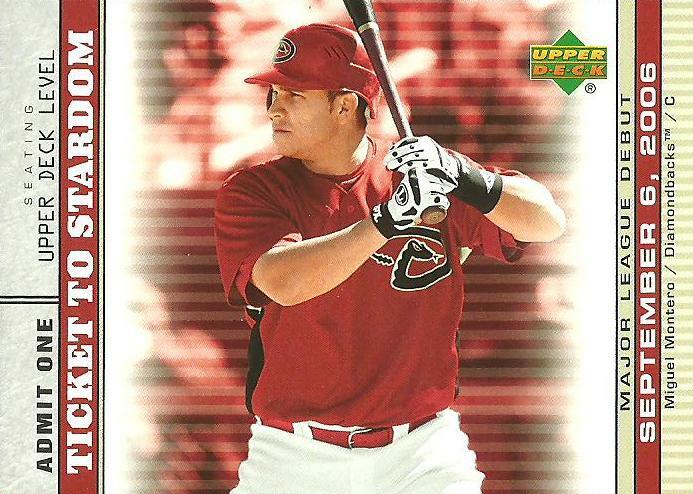 The packs were 2008 Topps Series 1, 2009 Topps Opening Day, and 2007 Upper Deck Series 2. 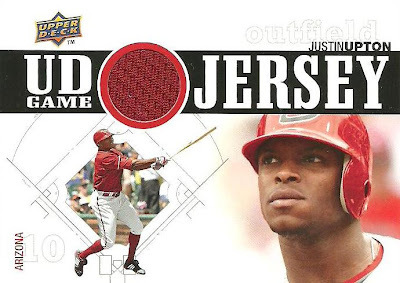 The 2008 Topps Series 1 pack didn't contain anything special. But I think I did pretty good with the other two packs. 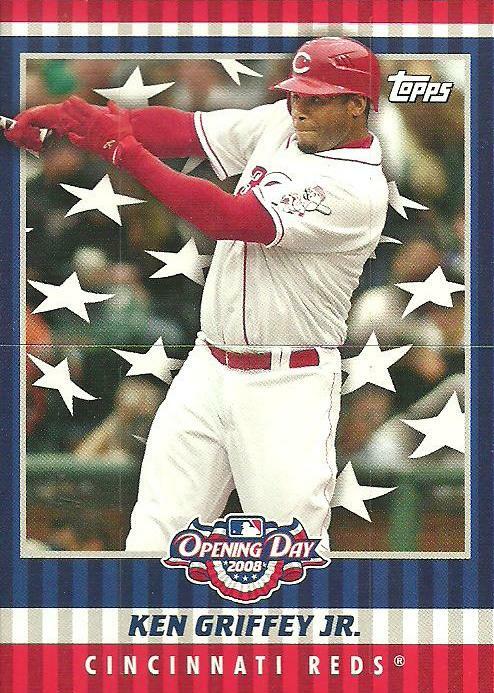 2008 Topps Opening Day KEN GRIFFEY JR. Flapper Card - Griffey has always been my favorite player. 2007 Upper Deck MIGUEL MONTERO Ticket to Stardom - Always nice to get an insert of a player on my favorite team. And here's my memorabilia card. 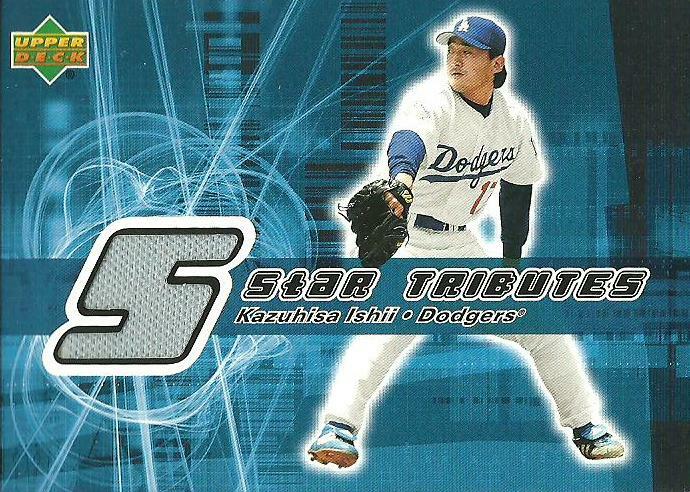 ﻿2002 Upper Deck KAZUHISA ISHIII Star Tributes Jersey Card - Nightowl, let me know if you need this and it's yours. Some more recent eBay purchaces. I got the 3 cards below from the same eBay seller in order to save on shipping. When I spread out the shipping costs among them, I ended up get each one for about $3.00. So let's see what I got. 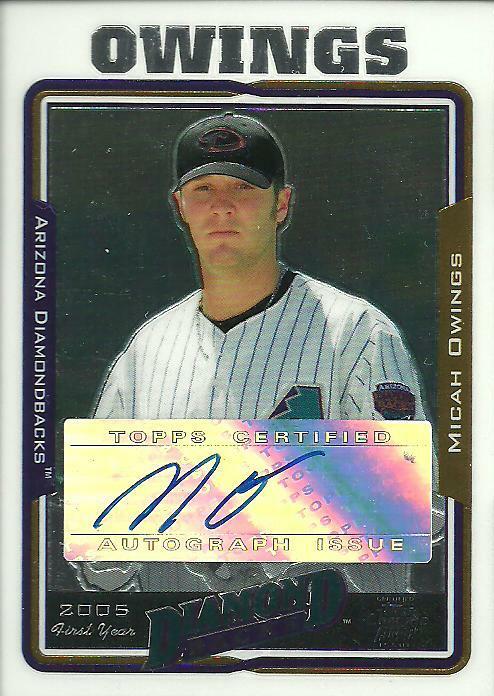 2005 Topps Chrome Update Micah Owings FY RC Auto - Micah is back with the D-Backs this year, after spending the last two seasons with the Reds. 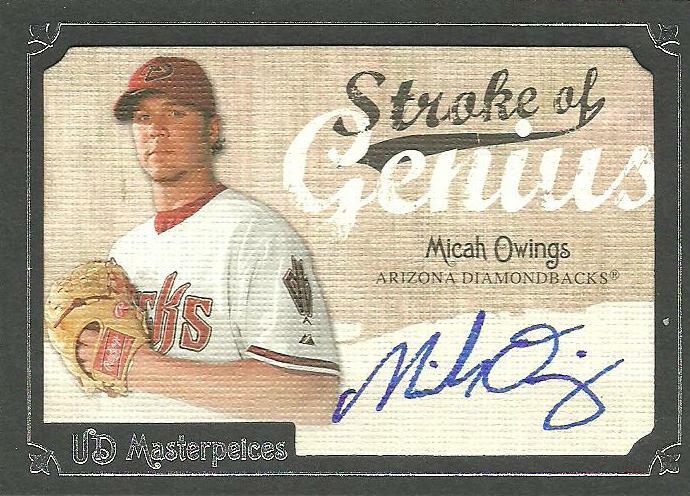 2007 UD Masterpeices Strokes of Genius Micah Owings Auto - Check out the difference in Micah's signatures. His 2005 Chrome Update autograph is just his initials, while this card features a much more detailed signature. I wonder what made him change. 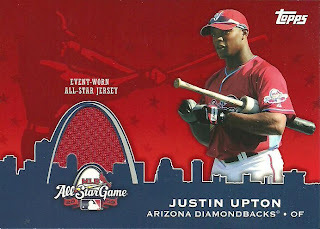 2010 Upper Deck Justin upton Game Jersey - I've always really liked these jersey cards (2010 UD) for some reason. I like the red jersey piece and I like the fact that he is wearing a red jersey in the picture. I got a couple of eBay purchases in the mail today. First up is this 2010 Topps Update Event Worn All-Star Jersey card of Justin Upton. 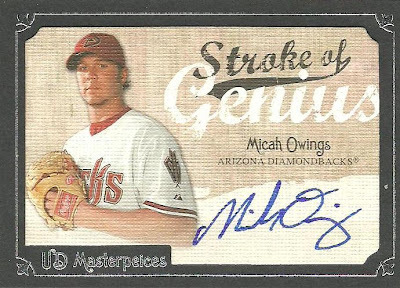 I have the Dan Haren version of this card, the other 2009 MLB All-Star representative from the Diamondbacks, so I have been wanting this card for a while now. I picked up this 2003 Topps Gallery HOF Artifacts Bat card of Bucky Harris because it was too good of a deal to pass up. I'll either trade it, put it back up on eBay and try to make a little profit, or I'll just hang onto it for a while. Bucky played from 1919 -1931 and was elected to the Baseball Hall of Fame as a manager. 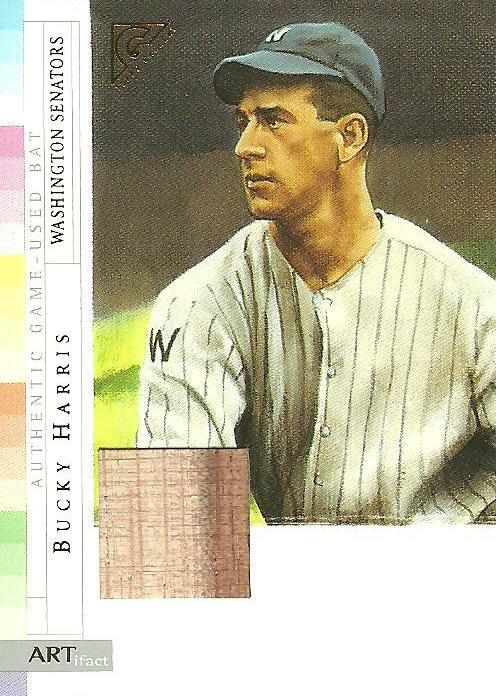 To my knowledge, the 2003 Topps Gallery HOF Artifacts bat card is the only Bucky Harris bat card that exists! Sometimes it's amazing what a dime can get you! My unexpected cards from Night Owl yesterday made me want to post about this 1994 UD Collector's Choice KEN GRIFFEY JR. card that I picked up out of a 10/$1 box at a card show about two months ago. 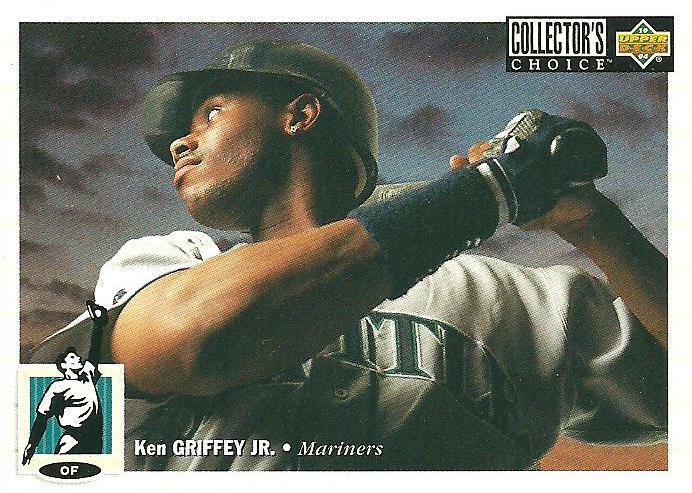 I have always been a Griffey fan, but am not sure I had this card before snagging it back in March for a dime. Besides it being of Griffey, the card is just simply amazing!